The Friends of Lopez Hill was founded in 2005 as a response to the threat of development of Lopez Hill. We are an organization of concerned citizens who are interested in preserving the 400 acre Lopez Hill property as open space. This very special property is one of the last remaining large parcels in public ownership and we would like to keep it that way. The Friends include nearby property owners, bicyclists, horseback riders, hikers and runners, nature lovers and scientists; and many others interested in preserving open space on Lopez Island as we face increasing pressure from human development. The Steering Committee meets on a semi-regular basis. We are working closely with Jamie Stephens of the San Juan County Council, the San Juan County Land Bank, Tim Clark – the Land Bank’s steward on Lopez Island, the San Juan Islands Preservation Trust as well as the Mitchell Hill Conservancy and the Dept. of Natural Resources (DNR) and other public and conservation agencies. The mission of the Friends of Lopez Hill is to protect the 400 acres on Lopez Island known as Lopez Hill, and to preserve and keep it in the public ownership and use for present and future generations. • Public use will not severely damage or impact those pristine qualities that make the Hill a valuable preserve for its ecological community and a sanctuary for its human visitors. • Educate the public about the ecology, history, uses, and assets of Lopez Hill. • Foster a management plan which will maintain the present character of Lopez Hill by providing low-impact public access, preserving its natural resources, and encouraging sustainable, non-motorized recreation. • Protect the environmental integrity of Lopez Hill by sponsoring baseline ecological studies, developing an invasive species strategy, and identifying sensitive areas for protection. • Encourage public participation in the management and stewardship of Lopez Hill. Starting in May and June of 2006 with a letter writing campaign to the DNR, and state and local legislators we were able to raise awareness of the great community interest in Lopez Hill. Further efforts resulted in the execution of a 50-year lease between San Juan County and the DNR which was finalized in June 2009. We’ve published Mission and Vision Statements to articulate our goals and help to communicate to the public what we are trying to do. We’ve mapped the trails on Lopez Hill, created a new trail to connect the public access to the existing trails, and published a map of the trails. Download the map: Lopez Hill Trails (PDF). We provide maps at various locations on Lopez: the Bookshop, the Lopez Chamber of Commerce, Isabel’s Espresso, Village Cycles, the Islander Resort. We request a $1.00 donation for each map to help defray printing and administrative costs. 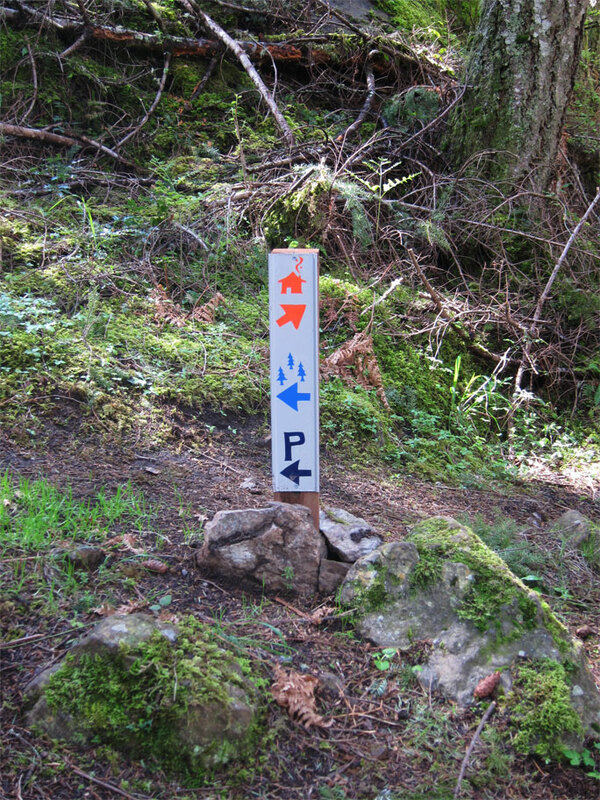 We’ve created a system of icons to serve as trail markers, and Land bank Steward Tim Clark painted & installed the signposts on the trail system. In order to insure that Lopez Hill is preserved as public space in perpetuity, we must convert the 50-year lease with the Washington Department of Natural Resources to a purchase agreement whereby San Juan County would own Lopez Hill. Only when this goal is accomplished can we say that Lopez Hill is truly preserved for future generations. See the Preserving Lopez Hill Forever page for information on the campaign to purchase the Hill. We gratefully accept donations to help defray administrative costs (map printing, flyers, postage, signs, etc.). Please make checks payable to Friends of Lopez Hill and mail to: P.O. Box 292, Lopez Island, WA 98261.